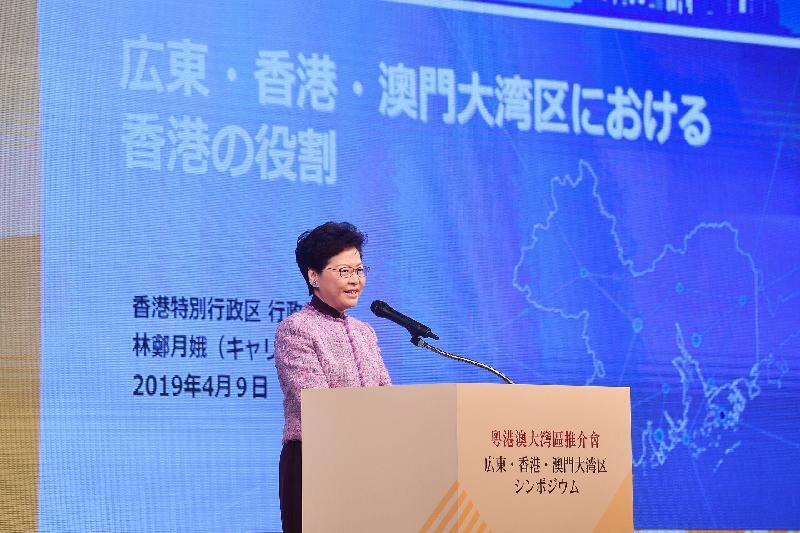 The Chief Executive, Mrs Carrie Lam, today (April 9) met with the Prime Minister of Japan and delivered a keynote speech at the Symposium on the Guangdong-Hong Kong-Macao Greater Bay Area jointly organised by the governments of Guangdong, Hong Kong and Macao in Tokyo. 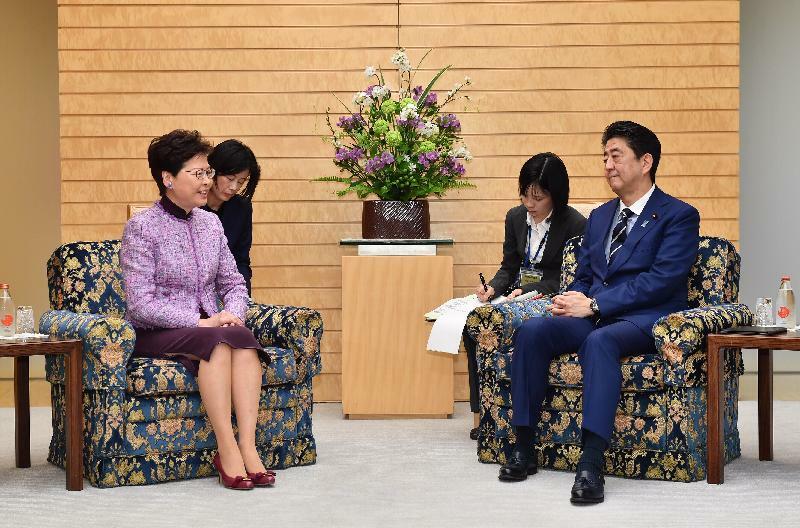 At noon, Mrs Lam met with the Prime Minister of Japan, Mr Shinzo Abe. She thanked the Japanese Government for its arrangements and assistance, making it possible for her to have two fruitful visits to Japan within half a year. She said that the main objective of her visit this time was to attend the Symposium on the Guangdong-Hong Kong-Macao Greater Bay Area held by the governments of Guangdong, Hong Kong and Macao and that she was pleased that the response to the Symposium from various sectors in Japan had been overwhelming with more than 1 000 participants, which is a testimony to the interest of many Japanese enterprises and people in participating in the Greater Bay Area development. 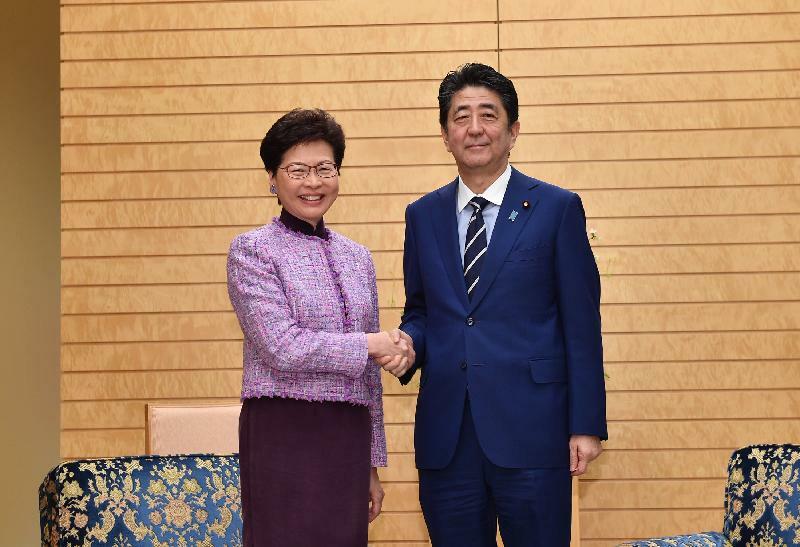 She said that Hong Kong and Japan enjoy close ties in trade, economic affairs and people-to-people exchanges and that the Japan Autumn Festival in Hong Kong, which has been held annually since 2016, is very well received by members of the public, attracting hundreds of thousands of participants each year. She added that she believes that both places could further enhance co-operation, in particular in the provision of elderly care services to respond to the challenge of an ageing population. Both sides also exchanged views on other issues including food safety at the meeting. In the morning, Mrs Lam, together with the Governor of Guangdong Province, Mr Ma Xingrui, and the Secretary for Administration and Justice of the Macao Special Administrative Region Government, Ms Sonia Chan, attended the Symposium on the Guangdong-Hong Kong-Macao Greater Bay Area, and they each delivered a keynote speech. Mrs Lam briefed the participants on the background and favourable conditions of the development of the Guangdong-Hong Kong-Macao Greater Bay Area, as well as Hong Kong's competitive strengths and important role in the Greater Bay Area. 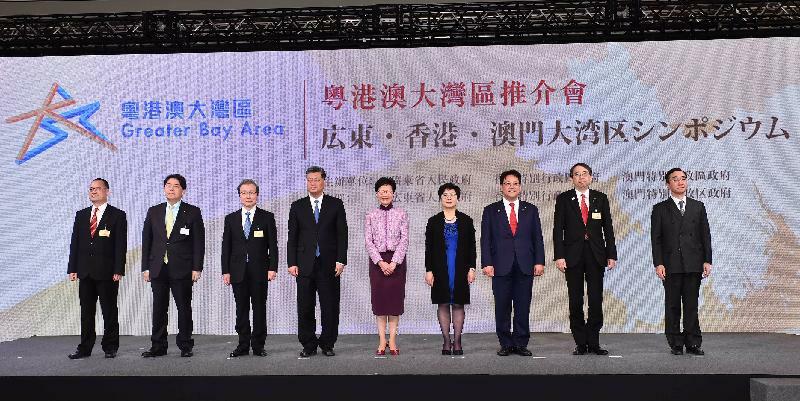 Pointing out that the development of the Guangdong-Hong Kong-Macao Greater Bay Area has unprecedented advantages, she said that Hong Kong will play an active role in the Greater Bay Area development. Hong Kong will leverage its status as a highly open and international city with a business environment that is open and facilitating, as well as its top-quality professional services, to complement the advantages of the nine Mainland cities within the Greater Bay Area, such as the size of their market, their well-rounded industry system and their relative strength in technology, to take forward the co-ordinated development of the Greater Bay Area and to further enhance Hong Kong's status as an international financial, maritime and trade centre, as well as an international aviation hub. She encouraged Japanese enterprises to make use of Hong Kong as a platform to explore the business opportunities in the Greater Bay Area. She also expressed her hope for enhanced co-operation with Japan on innovation and technology. Mrs Lam concluded her visit to Japan and returned to Hong Kong in the afternoon.